Today on our Community show, Stacey Bergeron and Bernadette Trafton joined Lori to talk about Boxes of Love For The Homeless. They started off talking about the ladies backgrounds and how they reconnected after many years for this outreach. They told us their goal was to make those they give boxes to feel loved. They also told us what they put in the boxes and their symbolic meaning, and highlighted touching stories of those who have received boxes. 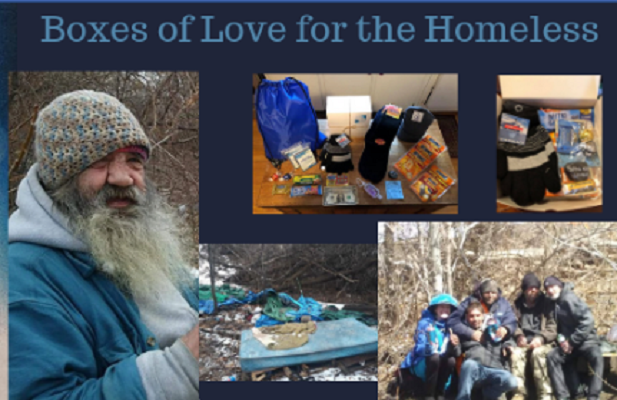 Next, They continued about the struggle of the homeless, sportive people who have partnered with them, stigmas surrounding the homeless and how to love who’s in front of us. Finally, they shared about their Wish List on Amazon where people can purchase items sent directly to the, so they can fill them to hand out. Watch or Listen in and hear more about it!